Welcome to Release The Writer Within. On Sept 1, 2012 I challenged myself, and anyone that may stumble upon this blog site, to a 30 day writing challenge. 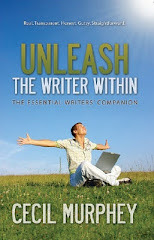 During the month of September I posted daily insights, as well as my own thoughts, from reading through each chapter and aphorism from Cecil Murphey's book Unleash The Writer Within. When I started this challenge the words spoken into my heart were "there is healing in the writing" not "there is healing in the perfect writing." As you will see when reading through my postings, that they are far from perfect. There are grammar errors and editing mistakes. But, in spite of the mistakes, I hope you will read between the lines and finds some words of wisdom! Since writing The 30 Day Writing Challenge there have been several challenges in my own life. I have done a lot of reflecting and soul searching trying to seek what direction to take in my writing and blogging. This is the insight that I have gained: I've come to realize that even if I never make the recommendations of any professional writer's or blogger's website or write a #1 best selling book, my hope is to bring encouragement to someone out there that may stumble upon this site, read this 30 day challenge, pick up a pen, and find that there is "healing in the writing" for their own heart! Thanks again for the encouragment my fellow writer and friend!